What we learned from stalking these it-girls on Instagram. Noting the innate chicness of all things French is about as groundbreaking an observation as “Joanna Gaines loves shiplap.” So why do we care so much about how the French do everything from wash their hair to cook their eggs? For whatever reason, even the mundane seems cooler when accompanied by a Parisian accent and a Breton stripe or two. Whilst stalking our favorite French it-girls on Instagram (which may or may not be a ritual conducted by this writer on a daily basis), we started to notice another trend we want to co-opt. The one thing each prolific mirror selfie had in common? A mantel that somehow looks both impeccably styled and perfectly imperfect. Not sure how to start decorating à la française? Read on for some serious inspo (and maybe a healthy dose of mantel envy). When in doubt, a mishmash of candles and flowers is the way to go. Throw in some dried flowers for a truly eclectic mix of blooms, and house the lot in a medley of vases that range from reclaimed bottles to ceramics. This Ikea set is an affordable way to get started on building your collection. If your style errs more on the side of minimalism, try one singular bouquet in a statement-making vase for an uncluttered surface. Casual observation taken from said stalking: The French appear to be less interested in collecting an assortment of different flowers into one bouquet, and instead opt for something that feels a little less curated—like this dried money plant displayed in a bright blue vase. Speaking of vases, your best bet for finding something similarly unique is at a vintage shop or flea market where you can get one-of-a-kind pieces for a steal. If you’d rather FedEx your new “French girl” style—H&M Home has a few pretty glass options that we also love. A mirror that blends into the wall! The two massive vases bookending the entire mantel! The array of photography oh-so-artfully displayed on the floor! There’s not much we don’t love about this little nook. 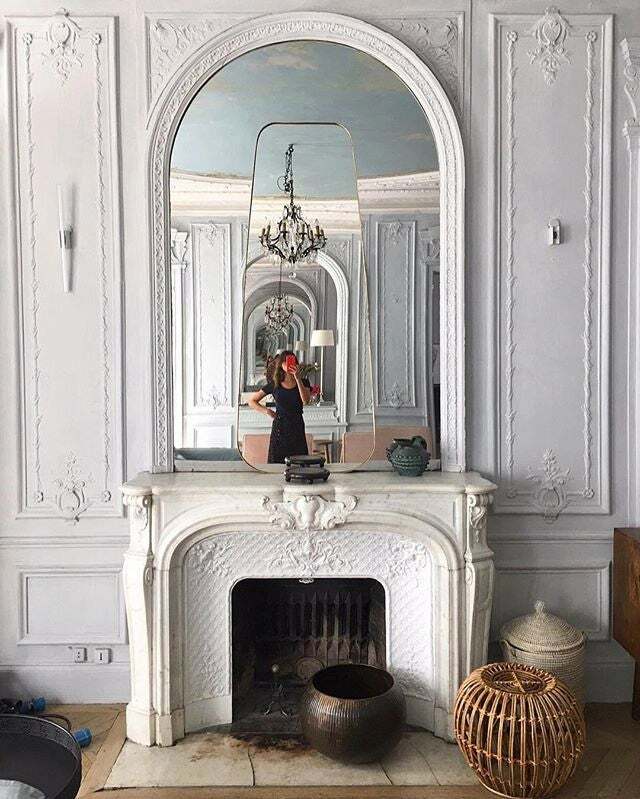 Maybe it’s the stylish befringed selfie-taker, but in our opinion, clutter (or vignette, as the French would have it) has never looked chicer. In lieu of a gallery wall, take a page from model-turned-it-girl Louise Follain’s style guide and prop up artwork or mementos, like vintage magazines, right underneath your mirror. With this much happening on the mantel, keep the mirror itself super simple; we like this one from Urban Outfitters or this (significantly cheaper) IKEA option. We sense a pattern: The more plants, the better—and this includes greenery in addition to pretty florals. Pick up a couple hard-to-kill plants for a natural accessory that will last more than a few weeks… even if your gardening skills leave something to be desired. If your neighborhood nursery doesn’t have anything you love, find some great options at The Sill. The perfect final touch? A cat. Find one at your local shelter. A fun twist on the classic gallery wall? One comprised of only mirrors. We love this eclectic array of different styles and sizes. Finish off the look with a tray full of perfumes and jewelry—turns out, the ultimate organizational tool is French-girl approved—for a sweet little corner that makes a statement. Harsh lighting is neither very French nor very chic, so incorporate some accent lights on your mantel. Break out those string lights left over from your dorm room years (or wedding) if you don’t want to toss them just yet. A muted, warm-hued bulb will make your space feel calmer and add a pretty glow to your next mirror selfie. Cowboy hat appreciated, but not required. This story was originally published in March 2018, and has since been updated with new information.